BarracudaGraphs is extremely proud to announce a new book in development, due to be released in September of 2010. 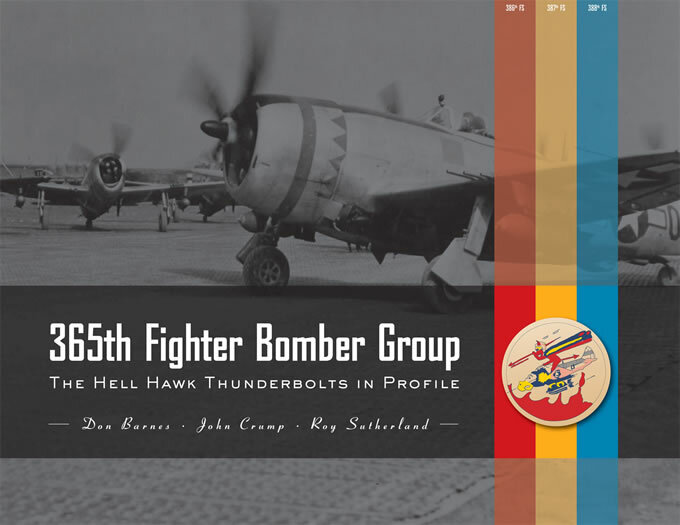 365th Fighter Bomber Group - The Hell Hawk Thunderbolts in Profile by Don Barnes, John Crump, and Roy Sutherland will shine a bright light on a Squadron that, until recently, has been almost completely overlooked. This new work was inspired by the excellent book "Hell Hawks!" by Robert Dorr and Thomas Jones, which recounts the history of the 365th FG during the last 2 years of the war. The Hell Hawks were a ground attack unit flying P-47 Thunderbolts with the 9th Air Force. They provided critical tactical air support to the Allied ground forces from the Normandy breakout until the last day of the war in Europe. Their stories are incredible; as fascinating and heroic as anything you'll hear from any other unit in World War II. Ranging from anti-Diver missions, to whirling aerial combats with the best the Luftwaffe had to offer, to amazing close air support missions against the Wehrmacht armies, the 365th FG brought the war home to the German armed forces in a brutal and relentless assault. The Hell Hawks flew some of the most dangerous missions of the war, and paid a heavy price. Spurred on by his growing interest in the 365th, professional graphic artist and friend Don Barnes started looking into this unit, and found almost nothing had been done to document the men and airplanes of this unit. He undertook many months of in-depth research, and in the process befriended a number of the surviving pilots and their families, many of whom provided much of the information that will feature prominently in the book. Don's relentless digging has uncovered a wealth of new information never seen before. He has spent many hours piecing together the complex jigsaw of photos, and has amassed a collection of 48 fully documented profiles, an astounding feat or research. Before this book, I have only ever seen one profile of an aircraft from the 365th, and even that contained errors. Don's profiles are complete down to mission markings and crew names. These beautifully rendered profiles will be printed one per page, supported with closeups of the artwork and scrap views of starboard side markings where applicable. Each aircraft will be supported by an in-depth description of the aircraft and it's pilot. With captions and sidebars by John Crump and a detailed unit history by Roy Sutherland, this book just might set new standards in unit histories. The book will be full color from cover to cover, and will be supported by hundreds of original, mostly unpublished period photos, printed in a large size on high quality paper. Decals covering a number of the 386th FG aircraft will be released in all 3 scales at the same time as the book, and I think that everyone will be surprised at just how colorful and interesting some of these aircraft are, but its the stories behind them that hold the real fascination. More news on this exciting new book and the accompanying decals as the publication date approaches.